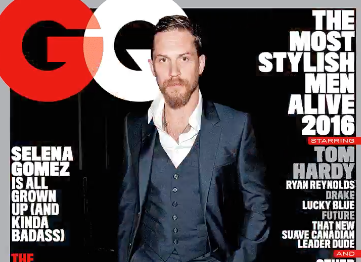 GQ’s annual ranking of the Most Stylish Men Alive comes with five cover stars: Ryan Reynolds, Future, Drake, Lucky Blue Smith and Tom Hardy. He always twists the classics just enough to keep them interesting. Future wears his geezer hats like a hipster, turning them into streetwear. For a certain type of rich guy, luxury means comfort. It means clothes that fit loose, so as not to constrict the swag. Clothes that look appropriate for watching, or even playing, sports. Dressing this way is a power move. It says: I can get in anywhere without so much as a collared shirt, because I am me. Drake plays this look to the hilt. While most fashion models toil as anonymous walking coat hangers, boy wonder Lucky Blue Smith has become insta-famous on Instagram for his innate style: Levi’s jackets, mall-rat hoodies, and platinum hair. He’s a total rake who wrings every drop of mojo out of a three-piece Gucci suit.